We’ve just completed an update of the 2017 online Master of Analytics and Data Science programs that are actively advertising on the web. 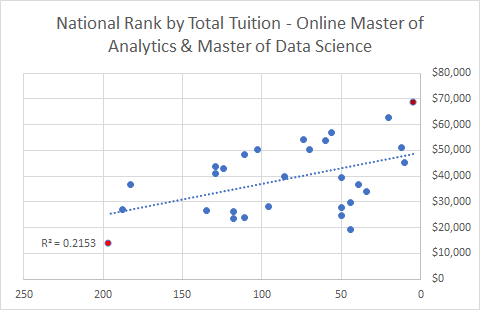 We found 59 total online master’s programs in this category: 42 are Master of Analytics (usually offered through Business Schools), and 17 are Master of Data Science (offered through Information Technology Schools). Six of these degrees are low-residency or hybrid programs that require students to complete some coursework on campus; the remainder are fully online. Both degree types offer prospective students highly valued workplace skills as Big Data experts in business, information technology / security, government, and health industries. 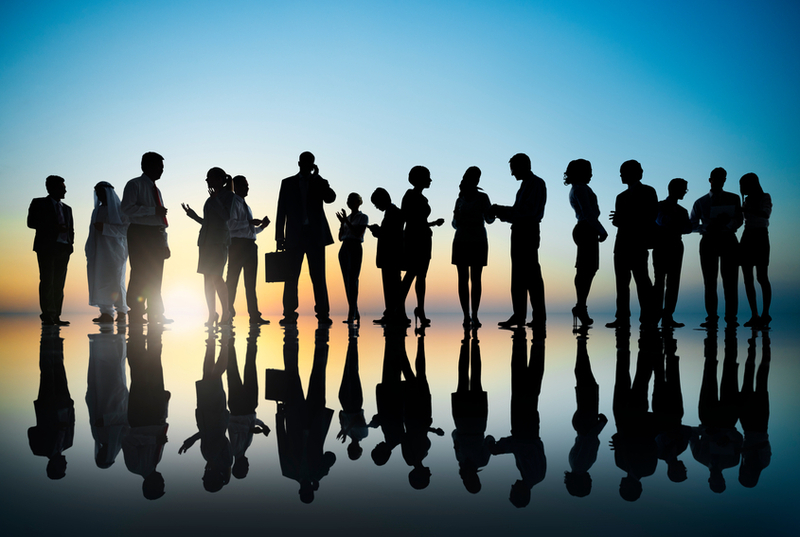 The Bureau of Labor Statistics indicates that Management Analyst positions, which usually require a master’s degree, are projected to grow 14% over the next ten years. Statistician positions, which also require a master’s degree, are projected to grow 34% over the next ten years! Most online Master of Analytics & Data Science programs do not offer concentration options. But among those that do, the most common include: Business Analytics, Marketing Analytics, and Cyber Security. Unique concentrations include: Financial Analytics, Geo-spatial Analysis, Financial Crime, and Social Science Analytics. Concentrations are often used by universities to differentiate their programs from competitors. Check out our post about top concentrations for the highly competitive online MBA. We organized the data to include those online Analytics & Data Science programs in our database that are at universities that are nationally ranked by U.S. News & World Report’s Best College ranking. We correlated national rank to the total tuition we found from program websites. There is a slight correlation (+.2) between the rank of institutions offering these degrees and the total tuition they charge. In case you wondered, the red dot at the lower left corner of the graph is for University of Alabama Huntsville’s program (U.S. News & World Report’s Best Colleges #200 and total tuition of $14,040) and the red dot in the upper right is Columbia University’s program (U.S. News #5 and tuition $69,192). The 29 nationally ranked programs are included in this cost analysis chart. The Online Degree Database is the only place where both students and universities can find complete, up-to-date, and accurate details about online degree programs. Our data are taken directly from online program websites and include: university name, BEA region, state, degree name, concentrations offered, U.S. News & World Report Best Colleges Rankings, total credits required, cost-per-credit and total tuition, delivery modality and details on required residencies, prerequisite requirements, admissions requirements, and more. Our data are collected by highly trained individuals, not scanned. We do not collect personal contact information or sell leads to universities. Our purpose is to provide unbiased, comprehensive online degree information to researching students and universities with online programs.For more information about other online degree programs, the Online Degree Database is the best source available in the market. Find the degree details for over 3,700 online bachelor’s and master’s degrees here. Universities, work with the Online Degree Database directly to access unique and relevant intelligence about the online degree market. Contact Michelle at michelle@onlinedegreedatabase.com for more information. Click here now to perform a no-cost search of Online MS in Analytics Degrees in the USIf you are looking for affordable online MS in Analytics programs, it can take days, if not weeks, of time to find them through traditional web searches. And both the cost and quality of an online master’s degree are relevant criteria to consider as you search. But, you’ll only find these details by searching individual program websites from hundreds of program choices. The Online Degree Database collects data from university program websites to provide complete, up-to-date, details for online master’s degree programs. This fall (2016), we collected data from the universe of online Master’s in Analytics programs actively marketing on the web. There are a total of 41 online Master’s in Analytics programs included in our database. If you are looking for career advancement, you should know that data science is one of the hottest employment opportunities in the market today. Surprisingly, the total tuition for each of these programs is under $18,000 (based on the data published on their websites). In addition to being affordable, four of these programs are offered by business schools that are professionally-accredited. Professionally-accredited MS in Analytics programs meet important standards in areas such as teaching, student learning, course development, and research. If you are shopping for an online degree, the Online Degree Database is here to help you at no cost to you. The database contains more information about online master’s degree programs than any website in the market today. Our goal is to help you find the right program, saving you significant amounts of time while providing the best information possible. Visit our website today to find other affordable online master’s degrees, and to explore other online Master’s in Business / Data Analytics programs, or any of the most popular online master’s degrees.